Men do have a noble cause, a big dream, an Idea that is raging in the man within the man. Life has not been fair, refusing to hand it over on a platter of gold — with some cherries on top. Life, at times, can be a nasty monster. Hurling hurdles over and over again until the once vibrant soul becomes weary in pursuit of the ultimate. The light that once burns bright is fast becoming a shadow. Now doeth a man be tempted to utter the word. The word that his father and those before him spoke to put him where he is— I Quit. Nope, not this time, that will be selfishness. If Thomas Edison had quit we may not have the light bulb today. How retarded the society would have been, had people like the Wright Brothers, Alexander Fleming, Martin Luther King Jr. quit. Life is like a connected web. The quitting of a man be like a pebble, cast into a river serene — ripples upon ripples, it spreads out to other parts. If a man quits, the effect does propagate down the line and a lot of destinies may be shattered — all just because one man QUIT. Some good people gave up, that’s why we have no good governance yet! A father that quits leaves no inheritance for his children and no head-start in life. A mother that quits breeds touts that murder the innocent kids of another mother that gets enraged and bent on revenge. Quitting would have been simple if the quitter will be the only one that suffers it. When a man quits, he makes life unbearable for some known or unknown persons. He let the reign of wickedness endureth a little longer. When a man on a noble course gives up, somebody somewhere bears the pain. Good people shouldn’t quit, there’s too much at stake. I know a quitter may do well, even after quitting. I know he may still be living fine, he can still afford daily meals and pleasurable needs of mortals. Alas! the laid-off staffs can’t, their children’s journey in life may be crippled, they can die prematurely, their friends can desert them, their wives can pack and leave! Just because someone decides to be a quitter. 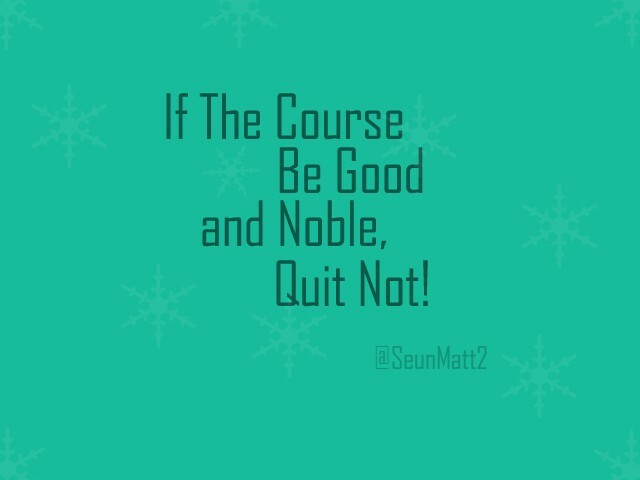 If the cause be good and noble — quit not!